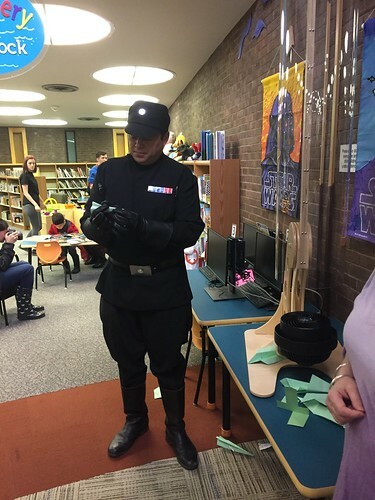 Star Wars Reads Day 2018 | Why a librarian? 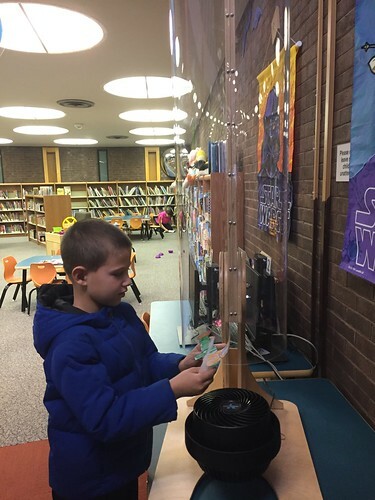 The best day of the year – Star Wars Reads Day! 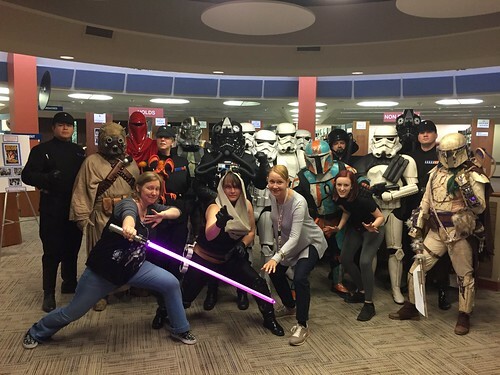 Well, at least for me, I get to be a Star Wars fangirl for the first few hours of my morning and just geek out while I let the Empire take over the library. I’ve been doing this since I started full time and I look forward to it every year. This year, the Old Line Garrison really came through with 15 troopers! 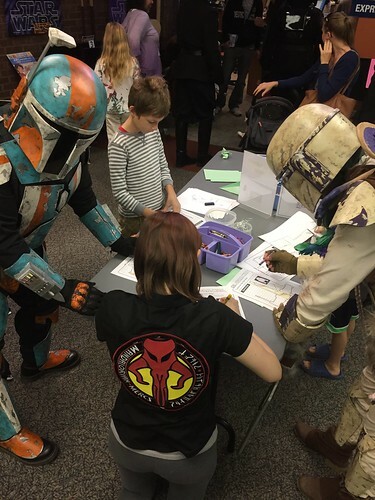 And then we had a few Mandalorians in the mix. It was great. They are so good at engaging with the kids and families. We also used this as a chance to show off our new green screen and wind tunnel, both of which were huge hits (though I just realized I forgot to upload my green screen photos before I left work, guess I will save those for Monday). 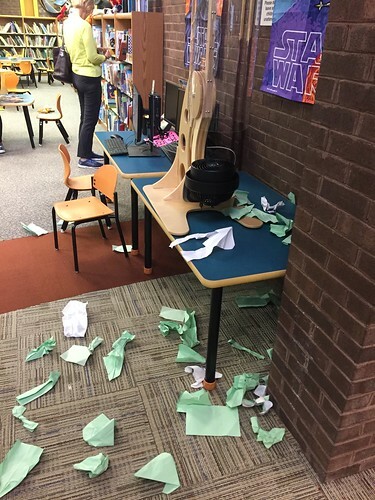 The kids were supposed to design their own “starfighter” and test it in the wind tunnel – in other words, fold some paper airplanes and see what happens! As you can see from the third picture in this set, many tests were done. 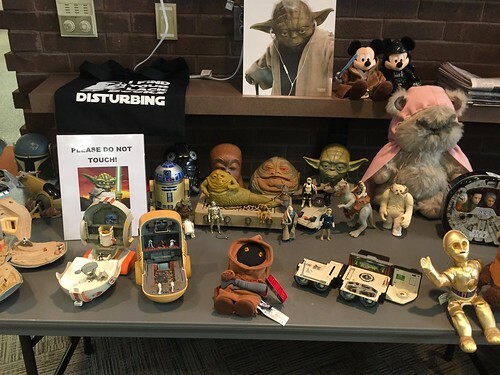 I brought some of my Star Wars collection with me to show off. 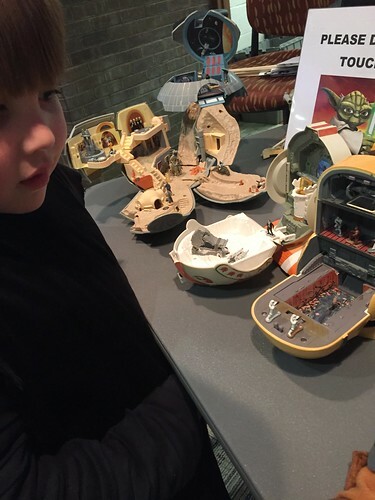 The kids were fascinated with the Micro-Machines and I had to sit and open all of the playsets to show them what was inside. One kid was trying to finagle my toys away, kept asking if I wanted to get rid of any of them and which one I liked the least LOL. I’ve done this so many years now, I have a great back catalog of craft ideas, so the set-up isn’t as intensive as other programs that I have to plan from scratch. Still, it makes for a very full, all-hands-on-deck 4 hours on a Saturday. But it is hard to not have fun with these guys wandering the library. The staff was fantastic, especially those trying to help people who came in, not expecting to see scifi characters in their library. Everyone worked together to make sure all the families had fun. ← Spring Festival of Children’s Literature – Round 2!